We also have a one cut rule in our state. Check your health Dept for guidelines as to what you can do. I use the one gallon twist tie bags from Walmart. 4.00/100 bags I think is about what they cost. If the greens are bolting it is too hot for them. Look for heat tolerant varieties. There are some out there. I think one is called Nevada. Grow them with shade cloth or floating row cover to keep the heat off them if you can. Thank you for your input. Always appreciate it. I have never heard of the 1 cut rule. Thats something I will have to look into. Meanwhile, I stopped by my local Restaurant Supply store and they had a couple different size bags. I bought a box of 1000, for $30. I want to say they are 8x5x15? Something like that. I harvested today, and DID NOT wash. I have every intention of letting the customer know to wash before consuming. Besides, I assume most folks are going to wash anyways when they prepare their meal, so I dont see it being a big deal. Here is the finished product. About 1/2 pound. So the bagged Salad Mix sold well. I only had enough cut greens to make 5 bags, so thats what I took. We sold 4 of the 5 bags. I think it really comes down to the fact that customers dont like to buy the last of any item. No big deal. We brought it home and lunch included some of the greens. So now I am onto my larger and improved salad bed. A 4x12 bed loaded with seed from corner to corner. I have been watering 3 times daily, to encourage germination. Long term I have no intentions of being tied down to watering manually, especially knowing that as soon as the heat ratchets up, im really going to have to stay up on the watering. On a side note, all the watering has paid off, Im already seeing germination. After this mornings market, I went to Lowes and picked up some circular mister/sprayers and spray stakes. These sprayers do the trick. Next purchase is shade cloth. Well, I ordered a piece of shade cloth. Found a good deal on a 50% shade piece on Amazon. Should be here Tuesday. This evening after the misters/sprinklers had a chance to run a couple of times, I noticed that there is clearly increased growth on the newly germ. seeds. This seems rather promising. Im hoping this allows me to have summer greens, especially if nobody else has them at the market. Your bagged lettuce looks great! Way better than any store bought lettuce. I would definitely buy when we can't grow lettuce here due to heat. How much do you sell that for at the market? Thanks for the compliments. This is my first year being successful with lettuce, as it usually bolts. The long cool weather has really helped, as much as we are all tired of it. Yesterday the half pound bags went for $3. The 4 customers who bought, complimented that it was such a great bargain. So Im thinking I could raise the price a bit and still do ok. My next batch of lettuce I am attempting to go Organic with, which would justify a price increase. Also, out of about 30 vendors yesterday, I think there was only 1 other with salad greens. Also, if this works out and I am the only one producing salad greens in the Summer, then a price increase might be justified. Im in a unique position that I am experimenting with new crops and selling at a new-to-me market. So I am still trying to gauge the customer base. Its entirely different then my old market. Just a quick update to the lettuce bed. All is going splendidly. The sprinklers are doing fantastic. Look at the sea of green. Only a few holes in there. Im thinking this would work really well for carrots, radishes, etc. Just about time to install the shade cloth. You mentioned radishes in your bed. They should do fine based on sister Pickle's little experiment. She used a plastic kitty litter pan with drainage holes drilled near the bottom for radishes. 6" deep pan with 4.5" of soil in it. This pan has been sitting on the front porch and gets maybe half a day of sun. So they reach for the sun and despite our trying to remember to turn the pan around every day to even it out, they still got real leggy. I had no hope for them. Today she found these French Breakfast! Note the curved tops. You know how radishes start pushing up out of the soil when they're about ready? My guess is that the radishes themselves started leaning towards the sun. So with your good greenhouse and bed and decent light you should get fine radishes! I ate the smallest one. Just a hint of heat whereas the ones down in the garden are starting to get hot. 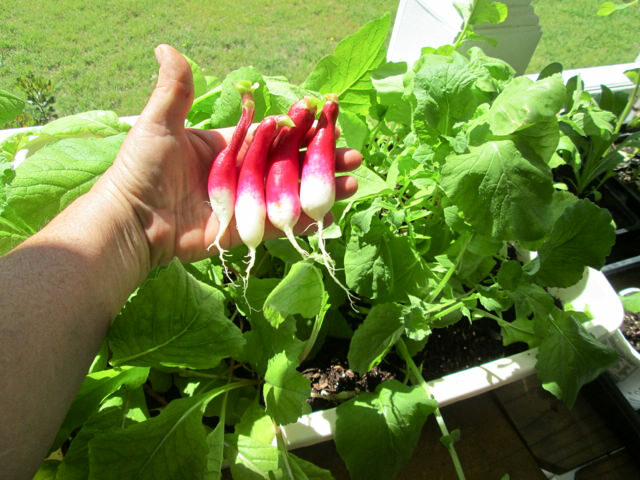 Those Radishes look similar to my French Radishes GoDawgs. Mine are misshapen just like yours, only smaller, probably due to the small containers they are grown in. Finally got the shade cloth set up on the lettuce bed. I have a sneaking suspicion the cool weather is gone. Well, at least for several, several months. Its not the prettiest job, but it works. Its amazing how well the shade works. If you wait a good while after the sprinklers run, and lay your hand on the lettuce, its very cool too the touch. Just what I was hoping for. Just an update to the 50% Shade Cloth experiment. The 50% is working, thats for sure. No signs of bolting or bitterness at all. The only negative is that it does slow down the growth a good bit. This could be seen as a positive if you need to hold a batch of lettuce over, until you need it later. I have adjusted the sprinklers to every 6 hours, for 5 minutes per cycle. Even after 3-4 hours, in the afternoon heat, the lettuce still feels moist to the touch. Im hoping this doesnt encourage rot of any kind. Next week im hoping to get another bed sown. Im hoping to be able to have lettuce well into Summer. Im also hoping my competitors wont have any. So, Organic Bagged Salad Mix in the dead of Summer = profit. FO, I hate to be "that guy", but if the lumber aorund your raised bed is pressure treated, your lettuce would not be organic. PT lumber is not allowed in OG production. I believe most inspectors allow it if it is painted first before installing. Just wanted to throw that out there in case it ever came up. Nope, no problem at all. If I was interested in becoming "Certified" then I might feel a sense of urgency. I have no interest, at all. I should have been more clear. The other 3 Beds that already exist were constructed of regular 2x10's. They currently have Snap Peas in them, which are about done for. As soon those come out, the beds will be topped off with more compost/leaf mulch, then my Lettuce blend will be sown. As far as my recent construction of PT Beds, I plan to re-purpose the lumber for another project, somewhere else. That does include the recent PT Beds in the tunnel as well. These will all be removed. Im hoping that my other project, the one involving the Wood Mulch pays off. If there is good signs there, then I plan to use the Wood Mulch in the tunnel, with an attempt to improve the soil. When I talk to customers, I tell them that my Farm is transitioning to an Organic Farm. I explain the nuts and bolts if they want to talk about it, and they realize that a transition takes time. Most folks are happy with that and that we are local. They are even more pleased when I explain that in the last 18 years, I have never sprayed plants with Herbicides and Pesticides. From engaging with people, this seems to rank up there, pretty darn high. So from my standpoint, the critical changes have been with Fertilizer/Soil Building. Also funny enough, this is the first year that I built beds with PT. I have always used standard lumber. Go figure. I have only met a handful of people that this wasnt good enough for. I have not lost any sleep over it. Last edited by FourOaks; May 25, 2018 at 09:22 AM. Well Houston, we have a problem. I cut the salad mix this morning, and frankly, it looks like crap. I believe the 50% shade is too much. Its all stem and hardly any leaf. Looks like I need to order 30% or 40%. Also, looks like mushroom spoors are growing on the surface of the Leaf Mulch. I really dont like the idea of that. Not sure if that could make someone sick. No sense in taking a risk. I trashed everything I cut. I just got back from the Hardware store. I bought 1/2 an ounce of both Romaine and Butter Crunch. Im not going to mix these. Im going to grow plugs and transplant, perhaps growing baby heads of lettuce.